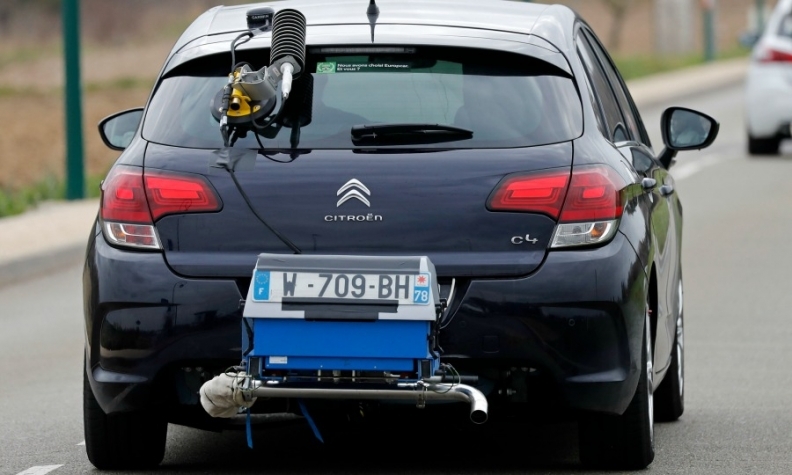 The Portable Emission Measurement System (PEMS) offers more realistic emissions testing on roads. BRUSSELS (Reuters) -- Following Volkswagen Group's emissions-cheating scandal, a new device that resembles a bicycle rack with tubing attached will become a common sight on cars around Europe over the coming months as a new way of measuring car pollution gains traction. The Portable Emission Measurement System (PEMS) aims to supplement laboratory tests -- the flaws of which were laid bare by the VW experience -- with more realistic testing on roads. But Europeans shouldn't expect to be breathing much cleaner air in the near future, experts and analysts say, because all the testing regimens in the world won't solve the problem until the European Union introduces much tougher pollution limits and finds a foolproof way to enforce them. VW's use of a banned "defeat device" has led to the scrutiny of a system that has allowed nitrogen oxide (NOx) emissions to reach up to seven times their European limits. EU officials who spoke to Reuters on condition of anonymity said that industry manipulation of the testing regime had been obvious for years. The European Commission failed to stop it, they said, because of the influence of the auto industry and because protecting a pillar of the economy was for many a higher priority than the environment. "I was not in the least surprised when this came to light. I just thought 'finally they have been caught' but I was amazed at their stupidity in trying to cheat in the U.S.," said one of five EU officials interviewed by Reuters. The officials, who asked not to be named because they are not authorized to speak to the press, said it was a mistake to leave vehicle regulation primarily in the hands of the industry section of the European Commission, rather than the environment department. Although regulators did not know of anything clearly illegal going on, they were aware loopholes were being exploited and chose to tune out the problem, the officials said. "There was no push from the hierarchy," said the EU official. "It was failure by neglect." A second official said: "Policy officers [on the lower levels] develop a desire to do something meaningful ... higher up, they don't want to rock the boat. The lower down the pecking order you are, the closer you are to the facts." Commission spokeswoman Lucia Caudet said the Commission had worked for many years to improve regulation in consultation with all relevant parties, including the car industry. "The Commission always acts in the general European interest, not in the interests of any one group or stakeholder," she told Reuters in answer to written questions. PEMS have been used on trucks for years following a previous defeat-device scandal in 1998, which, like the Volkswagen case, was discovered in the U.S. Early versions of the device, which cost around 150,000 euros ($166,335) each, were too heavy for cars, but they have since become less unwieldy and are going on trial pending their mandatory use as part of EU vehicle authorization from September 2017. A VW spokesman said the company was already using the devices to test carbon dioxide (CO2) and NOx emissions in research and development. Emissions Analytics CEO Nick Molden bought a PEMS in 2011, seeing a business opportunity serving people who wanted to know why their cars used much more fuel, and therefore produced more CO2, than manufacturers promised. An economist by training, Molden specializes in advanced modeling techniques to help businesses extract profit from data. His company, based in an industrial unit in Feltham on the western edge of London, attaches the device to cars, drives them around and collects the data, selling it on to interested individuals, businesses and even regulators. So far it has gathered data from 1,000 vehicles, Molden said. Business is brisk. Five major automakers subscribe to Emissions Analytics' database and the company set up a Los Angeles branch in 2013. Molden said the PEMS is a powerful tool but questioned how effectively its use would be enforced given the long history of industry, together with member states, diluting Commission plans. Since he formed his company, Molden has been invited to sit on EU working groups to debate proposed legislation in Brussels, and the experience is instructive. "It's clear for all to see the power of the automotive lobby versus the number of specialists from the Commission side. German manufacturers send their top engineers," he said. Only a month after the VW scandal was exposed, Germany and the car industry lobbied successfully for leeway to allow them to carry on polluting above official limits up to 2021 and beyond. They argued they needed the flexibility to protect the profitability of an industry that provides around 12 million jobs, directly and indirectly, and accounts for 4 percent of EU GDP, according to European Commission data. Isolated EU officials have spoken out for the use of PEMS for years to tackle diesel fumes. In 2011, then-Environment Commissioner Janez Potocnik noted PEMS were already being used for trucks and said the Commission was working to ensure the "necessary technical developments" were completed by 2013 for cars. But resistance to the system is inevitable, analysts say, as carmakers are wedded to testing in laboratories using dynamometers, which they say they provide a predictable, repeatable result. By contrast PEMS are affected by many variables, such as different altitudes and temperatures, known as "boundary conditions," a spokesman for the European Automobile Manufacturers' Association (ACEA) said. Ongoing debate to define these boundary conditions legally could amount to another watering down of standards, Molden said. It is not clear how using PEMS would affect a system that has grown up in Europe whereby the government agencies that put their seal of approval on the cars -- so-called national type approvers -- work with manufacturers to put the cars through tests. That system has tolerated practices such as the use of specially prepared cars, known as golden vehicles, which are primed to be as fuel efficient as possible. Air conditioning is turned off, for instance, and special fuel and tires are used. The European Commission says PEMS will make it much harder to cheat. But although the Commission is redoubling efforts to tighten the regulations, it has stopped short of proposing a powerful independent regulator along the lines of the U.S. Environmental Protection Agency, the body that forced Volkswagen to admit its use of defeat devices.